Least expensive V8-powered car in India. Yup, you read that right. 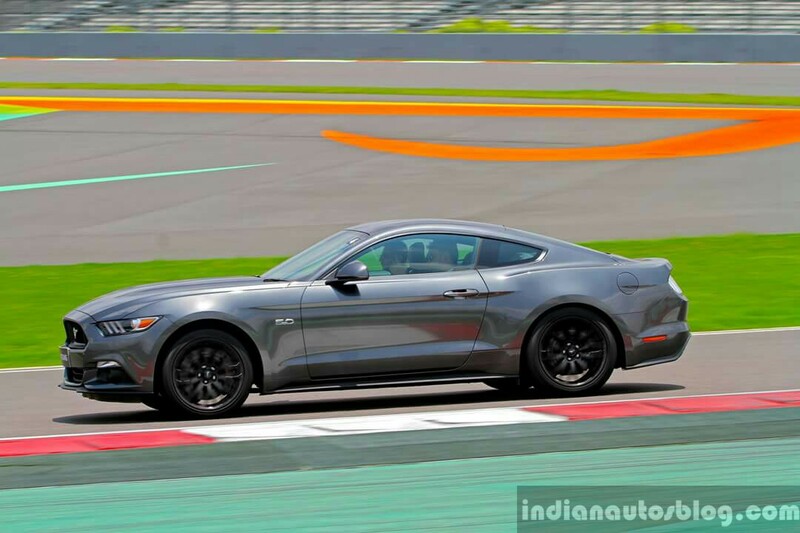 Priced from INR 65,00,000 (ex-showroom Delhi), the Ford Mustang GT is indeed the least expensive V8-powered car in India. If you're looking for an alternative, get ready to pay more than double for European V8-powered alternatives. Either this or a well-spec'd Audi TT. I know which I'm choosing. Hint: it has a V8 engine. After 52 years and 5 generations of the Mustang, Ford has finally launched the pony car for sale in India. It comes at a time when Ford India needed a strong image builder for their revamped product lineup, and none does it better than the Ford Mustang; one of the most recognized nameplates in the automotive industry, immortalized in a wide range of Hollywood movies, arcade games that I grew up with, as well as many other examples of media. 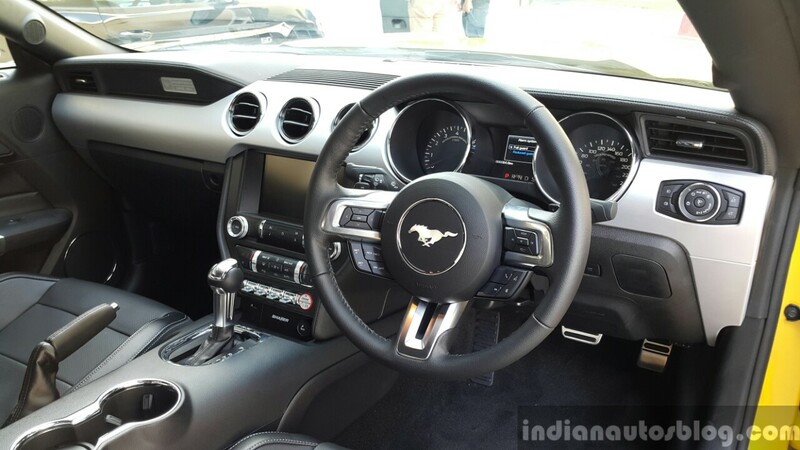 Until now, the Ford Mustang was exclusively available in left-hand-drive configuration, attributing to its unavailability in India. For the sixth generation Mustang, Ford finally bit the bullet and introduced a right-hand-drive version for export to more than 25 new markets around the world, thus breaking the long-standing tradition. It is quite odd to see a RHD Ford Mustang up close, but we couldn't be any more happier. And one of those markets is India, where the public welcomed the new Ford Mustang with open arms at the Auto Expo 2016 held last February. Instead of the fuel-sipping four-cylinder EcoBoost variant, Ford India went all out and launched the Mustang in its GT variant, which packs a full-fledged 5.0L N/A V8 motor for that true American (read: theatrical) driving experience. 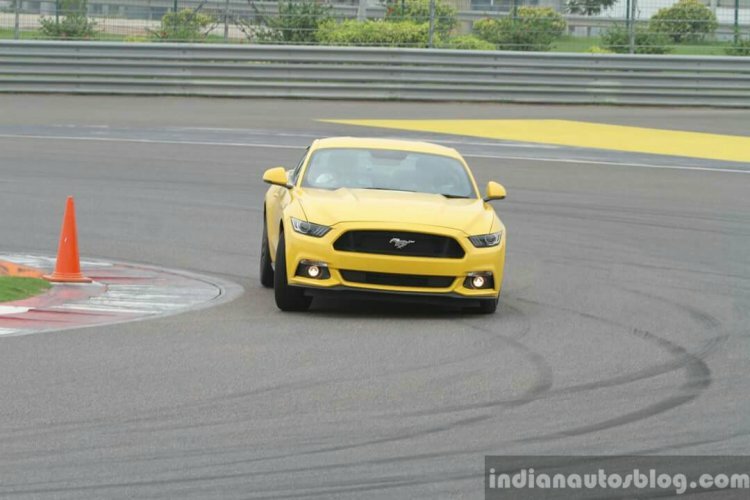 To enjoy a taste of this experience, Ford India invited Indian Autos Blog to test drive the new Mustang at the Buddh International circuit in Noida. "Push hard and have fun" were the reassuring words uttered by one of the folks from Ford, before I rumbled away in the new 'Stang. After spending five laps on the F1 track, here's what I think of Ford's newest pony car. Underneath that long, delightfully contoured hood sits a heavily revised 5.0L 'Coyote' V8 engine. It is slightly detuned for the Indian market so as to smoothly run on the lower-grade petrol more commonly available. This should come as a relief as it takes away the chore of hunting a fuel station supplying 97 octane petrol. Accelerating from the track's main straight at rest, the Mustang is capable of sprinting from 0-100 km/h in less than five seconds. It produces 401 PS at 6,500 rpm and 515 Nm of torque at 4,250 rpm, which is sent to the rear wheels. The Coyote is one of the few V8 engines void of any turbocharging in today's market, resulting in a smooth, lag-free and linear surge of power from idle. Accelerating from the track's main straight at rest, the Mustang is capable of sprinting from 0-100 km/h in less than five seconds. From a driver's perspective, the acceleration doesn't pin you hard to the seat but spikes an addictive rush. The aviation-inspired 'Ground Speed' label on the speedometer looks cheesy at first, but starts to make sense once you pin the throttle pedal and watch the needle race past it. The aviation-inspired 'Ground Speed' label does start to make sense once you pin the accelerator pedal. 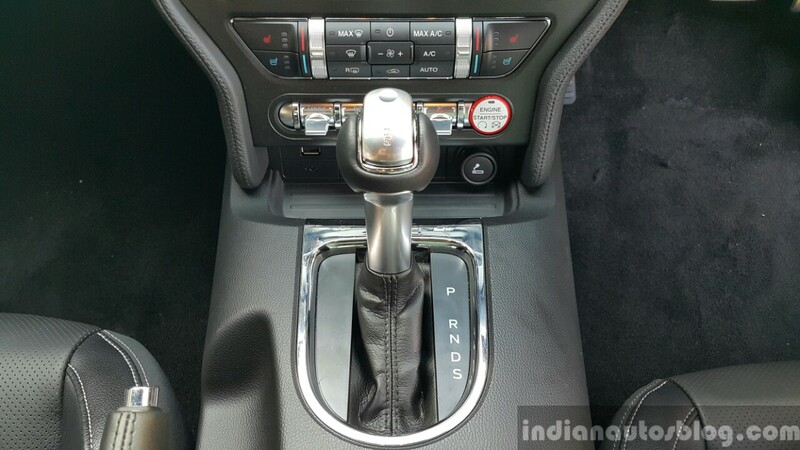 The Ford Mustang in India is only available with a 6-speed SelectShift automatic transmission. Although a Tremec 6-speed manual gearbox is offered in other countries, Ford India wanted to market the Mustang as a Grand Tourer, rather than an outright sports car. As a bulk of the Mustang's customers would spend more time in a traffic jam than on a race track, it was a sensible decision to equip the India-spec 'Stang with a slushbox. On a track, the 6-speed automatic isn't as fast as other torque converters fitted to more-expensive European cars, but it matches the response levels of the V8 motor. Set it into Sport+ with steering-mounted paddles activated, and the drive becomes more engaging. 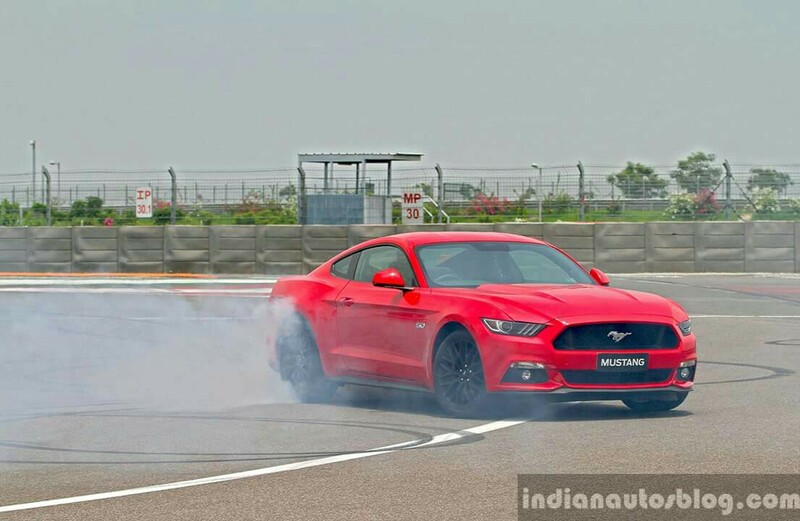 A bulk of Mustang owners in India would be spending more time in a traffic jam than on a track and hence offering the 6-speed automatic was a sensible decision. I found myself downshifting way ahead of the corner just to hear the deep V8 rumble. 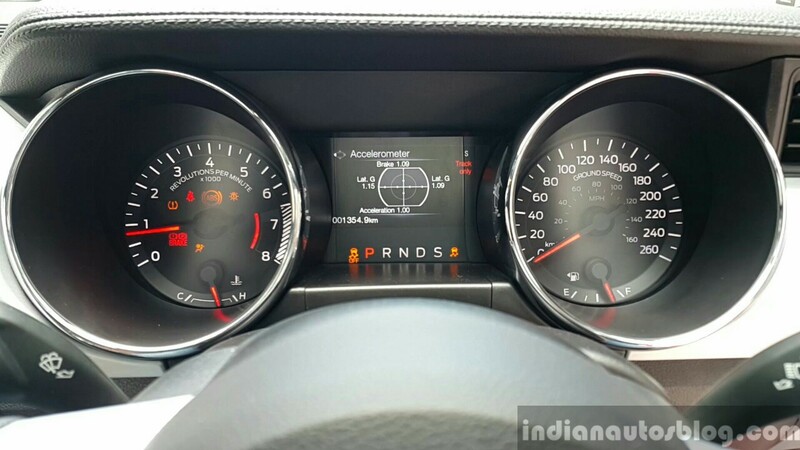 And the noise that fills up the cabin is generated from the engine, unlike from its speakers as one would find in the four-cylinder EcoBoost variant (not sold in India). 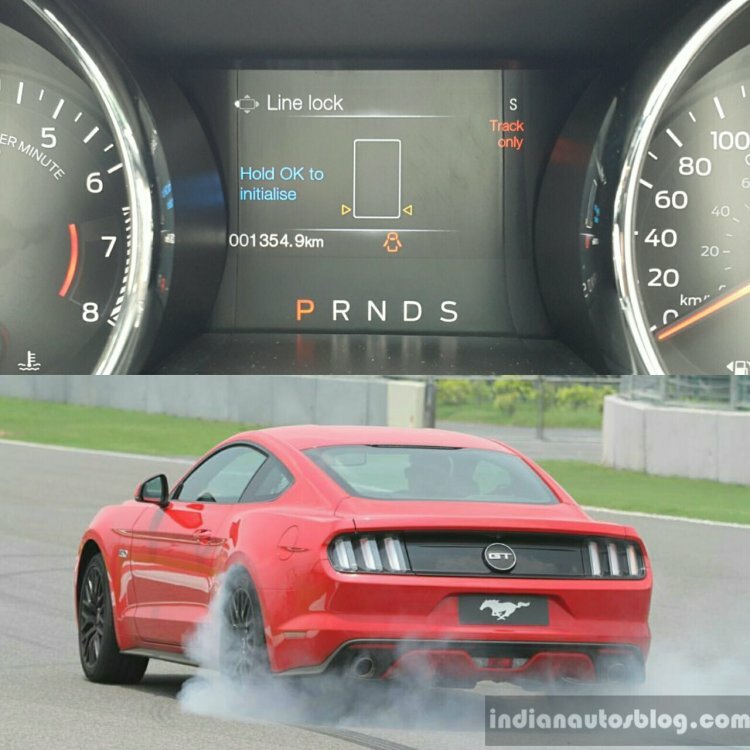 The Ford Mustang is one of the best-sounding cars for under INR 1 crore, as far as factory-spec vehicles are concerned. For the latest generation, Ford has slightly quietened the exhaust note of the Mustang to complement the GT experience, but that may not stop owners from fitting an aftermarket system. 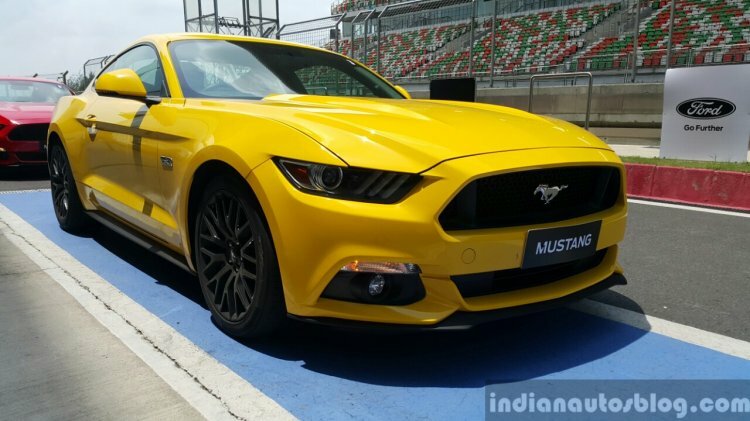 Given that the test drive was on an F1-spec race track, it's hard to pass a definitive verdict on the Mustang's ride quality without having a go on typical Indian roads. It's claimed to be more comfortable than its predecessors, thanks to the all-new independent rear suspension; replacing the age-old live axle rear suspension fitted in the last five generations. Cornering is not a strong forte of a regular American muscle car. However, around BIC's technical corners, the new Mustang incites more confidence to turn in at a faster speed. 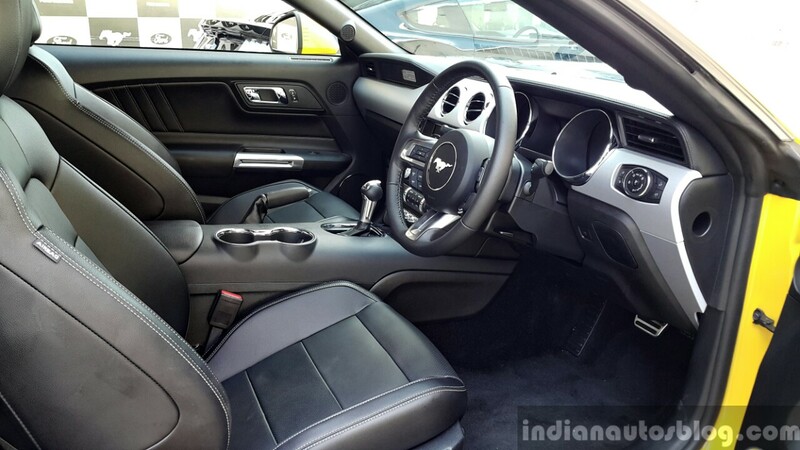 Take the same corner in the fifth-gen Mustang, and you'd be asking yourself "Should I? ", "Isn't it too much?". Since it's tuned to be a mile-munching GT car, the Ford Mustang does feel slightly wavy around corners. The electrically assisted steering system feels great, offering precise turn-in around BIC's banked multi-apex turn 10–11–12 sequence. At speed, the wheel weighs up perfectly and offers good feedback from the front tires while cornering. Brembo brakes for all four wheels offered immense stopping power after I managed to clock over 200 km/h on the track's 1.2 km long straight. The Mustang is equipped with Selectable Drive Modes: Comfort, Sport+, Track and Snow/Wet. You can feel its ESP fighting the V8 engine's torque, while the 255/40 R19 (275/40 R19 for rear) Pirelli Pzero tires managed to latch onto the intended racing line. In Sport+ mode, the ESP does allow the rear-end to slightly slip, reminding you that at your helm is a V8-powered American muscle car. The 'Line Lock' is a cool party trick, but you would be lighting up INR 70,000 worth of Pirelli Pzero tires. If you do want to put on a show, come to a halt, enable 'Line Lock' and let the rear wheels light up its tires. Line Lock lets you perform burnouts without wearing out the rear disc brakes by only locking the front discs. While it does look like a cool party trick, do note that you would be lighting up INR 70,000 worth of Pirelli tires in the name of entertainment. The styling of the new Mustang is instantly recognisable - long front hood, fastback roof and muscular haunches. It is an evolution of the retro-futuristic exterior of the previous gen Mustang, featuring contemporary as well as iconic design elements. Even in the standard GT trim, the new Mustang's styling has a sense of aggression not seen in the previous model. 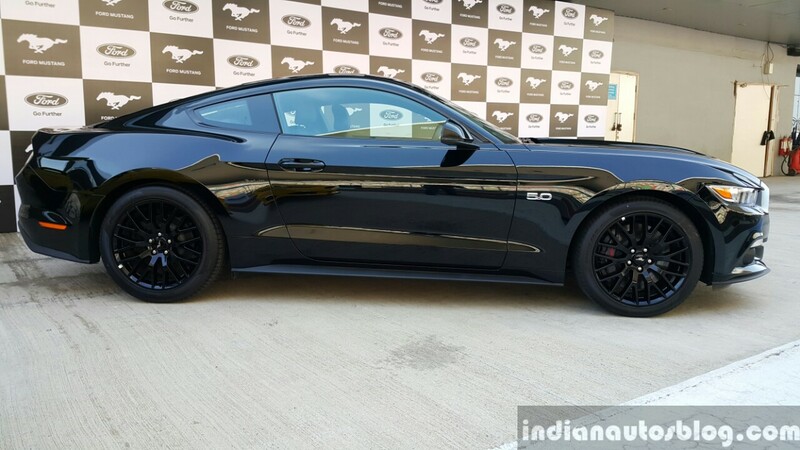 Even in the regular GT variant, the Mustang's styling has a sense of aggression that you could only get in Shelby/Roush/Boss variants of the previous gen model. Finish the exterior in Race Red or Triple Yellow Tricoat, and there will be eyeballs staring at the 'Stang from every corner. We didn't get to spend much time inside the new Mustang since it was a track-drive event. From what little we've experienced, the interior styling is more retro than its exterior. The Mustang's cabin is more retro than the exterior, and feels unmistakably American. Trimmed with generous amounts of aluminum and chrome, and upholstered in soft-touch leather, the cabin feels unmistakably American. Build quality falls short of European luxury cars priced within its range, but nonetheless still feels like a quality construction. Apparently, the first lot of Mustangs allocated for India have already been spoken for, reportedly. Not a surprising feat considering the fact that the buyer is a getting a V8-powered 2+2 GT car for more than half the price of similarly-spec'd European sports cars. 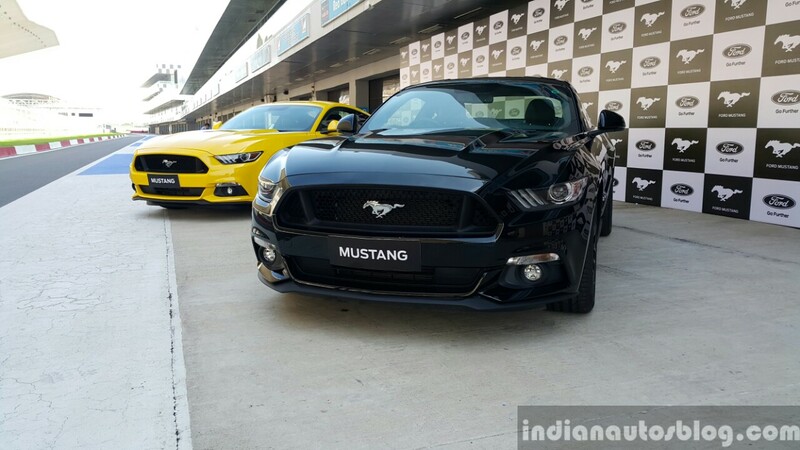 The first lot of Mustangs allocated for India have already been spoken for. Mustang customers in India will likely be spending more time pootling inside a city or enjoying a Sunday cruise on an empty highway; rather than pushing the 'Stang to its limits on a race track. So it would be interesting to review the Ford Mustang GT as a typical daily driver. If you have INR 75 Lakhs lying in an account somewhere, and are looking to splurge on an expensive toy, look no further. From my brief experience on the track, I can say that Ford has done a splendid job in making the pony car an all-round sports car capable of giving the Europeans a run for their money. Wrestling 401 horses with all assists 'off' in the Ford Mustang on a race track is the very definition of the word 'fun'. It may not zip past corners like the Audi TT or Mercedes CLA 45 AMG, but they're nowhere near as fun as wrestling 401 American horses with all assists off on a race track.